If you’re expecting a little one and are an Amazon Prime member, you’ll definitely want to take advantage of this SWEET and FREE Amazon Baby Registry Welcome Box! You can score a completely FREE Baby Welcome Box ($35 value – while supplies last) just for creating an Amazon Baby Registry and making a $10 purchase! NOTE: This welcome box never stays in stock long, so you’ll want to hurry! 10% completion discount 60 days before baby’s arrival date in the Baby, Beauty, Grocery, Drugstore, & Toys Departments (or 15% off discount if you’re an Amazon Family member!). Enjoy limited-time offers for Prime member Baby registrants, such as a free parenting eBook, Subscribe & Save discounts, and more! By the way, my sidekick’s FREE Amazon baby box included a FREE Amazing Baby Muslin swaddle, 35ct Lysol Daily Cleansing Wipes, 56ct Huggies Baby Wipes, NUK Pacifiers, Avent Baby Bottle, Onesie, several useful samples, and so much more! Note that the content of each box may vary. Want more baby freebies? Get a FREE Welcome Gift from Target’s Baby Registry, too! Hop on over to Amazon where you can snag this Oral-B Pro-Health Stages Avengers Assemble Toothbrushes Twin Pack for just $2.69 (regularly $7) – only $1.35 per toothbrush! These kids toothbrushes feature a tongue cleaner to aid with fresh breath and a cushioned head to protect your kiddo’s gums. They have Marvel’s Avengers designs and are designed for kids ages 5-7. The fall Target Beauty Box would be fun for your teen! 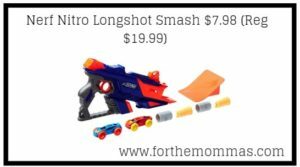 The post Amazon: Nerf Nitro Longshot Smash $7.98 (Reg $19.99) appeared first on FTM. Amazon has you covered with all of the delicious snacks you need to make your next game day party a hit, including nice savings on Fritos, Pepsi and more! And by the way, if you need a fun and unique game day snack idea, trying making these walking tacos (as pictured above)! Final cost only $10.49 shipped – just 26¢ per bag! Final cost only $10.50 shipped – just 88¢ per can! *Includes six cans of the original flavor and six cans of ginger flavor! Want to really make your party special? Amazon has 24 super fun NFL team themed Chips & Dips Party Boxes including the Patriots, Seahawks, Falcons, Steelers and many more! These packs include two 10oz bags of Tostitos Scoops! Tortilla Chips, one Tostitos Medium Chunky Salsa 15.5 oz jar, and one Tostitos Salsa Con Queso 15.5 oz jar. Through September 8th, hop on over to Amazon and score 30% off Bedsure Duvet Cover Sets when you enter the promo code GW9UV6R3 at checkout! This hyopallergenic duvet cover set is machine washable and features a zipper closure, sewed ties in all 4 corners of the duvet, and a wrinkle-resistant material. Amazon Home Services: $20 Off Deep Cleaning or Spring Cleaning! Amazon: Knife Sharpener Only $99.99 + FREE Shipping (Reg $210) – Today Only! Hop on over to Amazon where they are offering up this Nintendo Switch Zelda Breath of the Wild Starter Kit with Travel Case for just $9.99 (regularly $29.99)! Please note that this is an add-on item and will ship with a $25 order. This durable and soft canvas carrying case stores your console and up to 14 game cards. It also comes with a screen protector and cleaning cloth, silicone no slip grips for Joycon controller and high-quality stereo earbuds with in-line chat microphone. You can also score this Zelda Guardian Edition Deluxe Console Case for Nintendo Switch for just $9.99 (regularly $19.99) on BestBuy.com. This case can house up to five Nintendo Switch game cards.